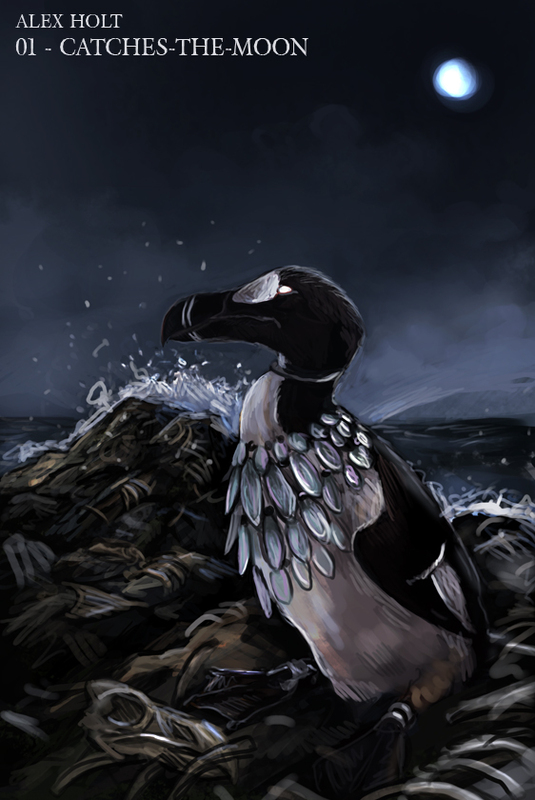 Catches-the-Moon is a folkhero of the Great Auks – as the first of her kind she came into the world devoid of food and so her people starved. Through trickery, she got the moon to send his children to the seas, where they became fishes which Catches and her people could feed on forever. Catches-the-Moon eventually died at a great old age and became a sometihng akin to a guardian spirit or a minor Goddess to her people. Forever however, was of course a finite thing – the Great Auks of course became extinct and now Catches-the-Moon is a Goddess of a species utterly vanished from the world. Not just no longer believed in, but not known by a single being in the world. She drifts through the seas aimlessly for the rest of time, with no people and no purpose. A slighty delayed first piece, a holiday to Spain prevented me from getting much done, although I did spend the plane journey coming up with a few characters ready to illustrate. Hopefully I’ll manage to do 2 characters a day enough to catch up. Beautiful colors, Alex- the clamshell necklace- or is it opal? either way, the sheen is very distinct- And such a sad story, too- sad, but effective!